What more can be said – watch the video and decide for yourself…our online presence can be real, funny, innovative, creative and engaging. Thank you Stephen for your dedication to teaching, learning and fun! Here is a great ice breaker activity for you if you have a few iPads to use in your classroom. You will need around one iPad per group of 2-6 students. Or, if you only have one iPad, create a trailer as a class. 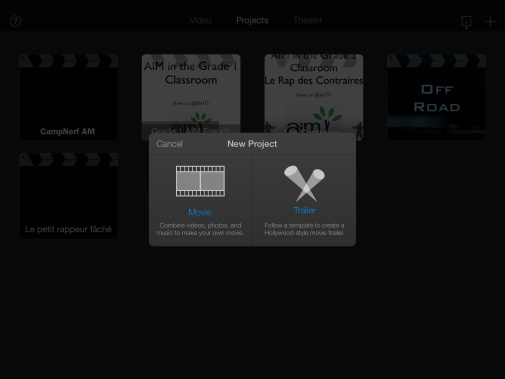 iMovie trailers is a very fun and easy way to create awesome short videos. Your class will probably be able to finish within one to two hours. Note that you don’t need to worry about any spoken lines. Have your students fist choose a theme, then figure out the written parts either before or during filming. Have groups of 2-4. Students should take turns filming and make sure each person is featured in the movie. 2. In the Projects tab, tap the + sign at the bottom. Select “Trailer”. This entry was posted in Tools for teaching. Bookmark the permalink.